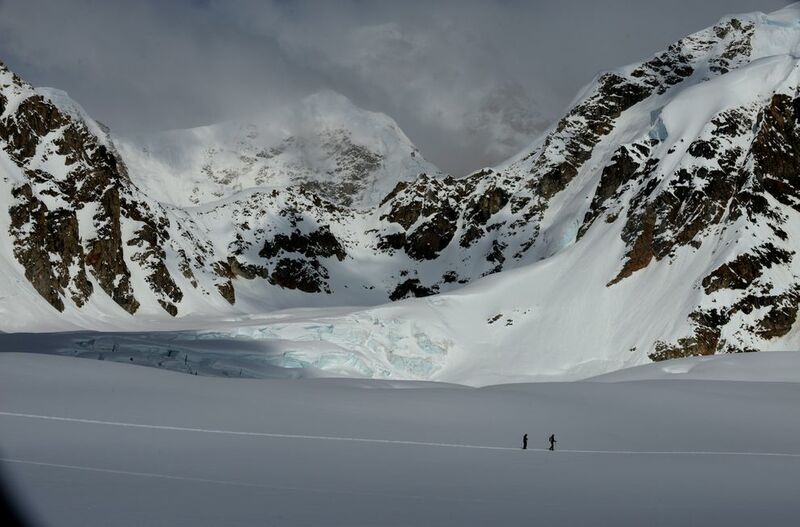 The radio message came in at around 1:30 a.m. Monday, in the endless daylight of Denali in June: A Slovakian climber had fallen deep into a crevasse on the mountain's West Buttress Route, into a coffin-like chute so narrow it was impossible for him to even turn his head. Over the next 14 hours an extraordinary rescue unfolded, with a group of rangers, guides and volunteers mounting a painstaking, frustrating effort to rescue a man encased 60 feet deep in a tight shaft of snow and ice. At 3:30 p.m., the climber, identified by the National Park Service as Martin Takac, 38, was pulled, severely hypothermic but alive, from the crevasse. On Tuesday, he was listed in serious condition in the intensive care unit of Fairbanks Memorial Hospital. In Denali's peak mountaineering season, conditions this year have been prime for crevasse falls, said National Park Service mountaineering ranger Chris Erickson, who described the rescue by phone after returning to Talkeetna on Tuesday. "We had a low winter snowpack combined with recent snow about a week ago. There are thin snow bridges over big crevasses," Erickson said. Officials believe Takac, descending off the mountain, fell into the crevasse while unroped. Erickson arrived at the scene of the fall, close to a camp at 7,800 feet on the West Buttress Route, at 4 a.m. Monday. From the top, the crevasse looked like "a hole in the snow. Blank, flat snow. No slope," Erickson said. At the very top, it was maybe 3 feet wide. By the lowest point, a "false floor" of snow and ice where Takac was wedged, it was "10 or 12 inches across," he said. The hole in the ice wasn't straight down. It "arced a little bit." Takac had fallen 60 feet down, deeper than originally believed. An experienced group of rescuers on the surface quickly realized they were in a desperate situation. "We had seven guides and four rangers and five volunteers and several bystanders, and basically none of us had ever been in a position like this," Erickson said. The narrowness of the crevasse made the rescue uniquely complicated. "We've dealt with much further falls. But the narrowness and the tightness, and the fact that he was still alive …," he said. The man was so stuck that he was having trouble breathing. It took eight to 10 hours just to get close enough to touch the climber. Rescuers were able to hook a sling through his backpack and break it, giving him enough room to help him breathe. Eventually they realized there was no getting the man out without widening the hole by hand, which meant chipping away at the ice. One by one, the five National Park Service rescuers began taking turns lowering themselves into the hole to try to chip away at the ice and make room to lift Takac to safety. It was so narrow that if you pointed your toes one way, Erickson said, there was not enough room to point the other foot a different way. Breaking away ice by hand, with an ax. Boiling water to melt the ice. Using a blowtorch in an attempt to expand the hole. "It was completely impossible to remove him without removing the ice around him first." It required extreme patience, and the ability not to panic in the most claustrophobic of environments. Roped up, deep in the crevasse and using power tools like chain saws, the rescuers had to be vigilant not to accidentally cut their own lines. The climber was fading. At first he was able to speak to his rescuers, saying, "Snowshoes, snowshoes." Then began a painstaking process in which one person would be lowered into the crevasse at a time, using an air chisel to chip away at the walls of the chute. Eventually the rescuers cleared enough room to get underneath Takac and to free his legs from the snow and ice. He was cut free from the snowshoes. "At that moment it was like, hallelujah, he's actually free, which seemed impossible hours before that," Erickson said. When Takac reached the surface, he was "way past severe hypothermia." A waiting helicopter rushed him to Fairbanks Memorial Hospital. What made the rescue work? For one, patience, Erickson said. The low point was "the first 15 hours," when the situation seemed bleak. "At one point we had a small breakthrough where we could clear one of his arms. And at that point we clipped in his harness and we're thinking, all right! This is after 10 hours. But we start pulling and realized it was not his chest, arms or waist, it was his legs, feet and snowshoes, completely buried. They were feet lower, and every inch got tighter and tighter." That's when they accepted that the only way out meant finding a way to remove "literally tons of ice." Teamwork helped too. At one point, a relief crew arrived by helicopter and brought with them tools, including a pneumatic hammer-chisel on loan from the Talkeetna Volunteer Fire Department. That "air chisel" tool proved invaluable in removing ice. "There's no way less than 25 people were involved in this rescue," Erickson said.